My Channeling teachers, Sanaya Roman and Duane Packer, told me Channeling is not for the faint of heart. Over the last 30 years of being a professional Channel, I have found that to be true. Along the way my heart has been strengthened in ways I could not have imagined. The work of practicing Channeling has brought me healing, peace, fun, compassion and very many unexpected joyful manifestations. If You are drawn to learning this skill and practicing it, I feel sure Channeling will enhance Your life and spiritual growth. I once heard an Olympic coach say that it takes 10 years, four hours a day, to build an Olympic athlete. I told this to my friend, Janette, and we decided then to practice Channeling every day for 10 years, and we did. The time spent was well worth the effort on so many levels. If You are not drawn to Channeling an Ascended Master, or High Level guide, maybe Your interest lies in connecting more strongly with Your High Self. A dear friend of mine, Max, was a minister and incredible professional artist. Her religion taught her not to listen to a Channel. We were close friends, and I needed practice, so she willingly let me give her readings and then she gave me feedback. Over many months she saw the benefit and validity of my Channeling and became more open to it. She came to realize that she was Channeling an artist, Paolo Veronese, who had been helping her with her painting. The times require us to open to our spiritual gifts for our own peace of mind and to help others find calm during these turbulent times. Channeling a High Level guide does not interfere with Your own free will but enhances it. Conscious Channeling, not trance Channeling, is what I’m speaking of. Your intuition and awareness are strengthened, confirmed and affirmed with this practice. One day I was out running errands and hoping to receive money in the mail. I looked in my P.O. Box, and it was empty so I decided to do the things that didn’t require cash. I left the post office and was about a half mile away when I felt I had to go back and check again. I did. When I opened my box, right at that exact moment the clerk’s hand reached in and gave me the letter with the cash. That had never happened before or since. Just at that moment I opened my box, he put the letter in. I laughed, and so did he. I live for these synchronicities and small miracles. My day completely changed as I had the financial ability then to complete my list with a smile and feeling my Divine Guidance. There are many types of intuition and we all have most of them, even if they have not awakened yet in our consciousness. In 1982 I took my undergraduate degree in International Relations at San Francisco State University. One of my minors was in a new program, “Nexus, Science and Humanities Convergence.” The new Science at that time, which is common now, was the difference in right- and left-brained thinking. The right being artistic, intuitive, dreamy and mystical, or unexplainable in current cognitive structures; and left hemisphere being logical, scientific, rational and possibly provable and tangible to the normal senses. The many courses I took were not only fascinating but were confirming of what I knew of my own intuition at the time. One overall theme of all of the courses was that we in the West had a split brain, which gave us a split culture. With our whole brain working in many people now, we are creating a whole and healed world. On a frequency line of color, light and sound there are an infinite variety of notes, colors and light. Radio stations each have their own Channels. Our own physical, mental and emotional chakras have their own unique color frequencies. The combinations of color, music and light are infinite. So are the Channeling frequencies. Meditation, clairvoyance, intuition, Channeling, mediumship, contemplation, Beingness and Your still, small voice are all different frequencies. The skill of consciously channeling a High Level guide through Your own High Self, who is also of a High Frequency when not overshadowed by doubt and disbelief, offers a variety of wisdom according to Your own desires, dreams and interests. If You would like to learn how to Channel, start with Sanaya and Duane’s book Opening to Channel: How to Connect with Your Guide. I offer coaching also. You may contact me by clicking here. 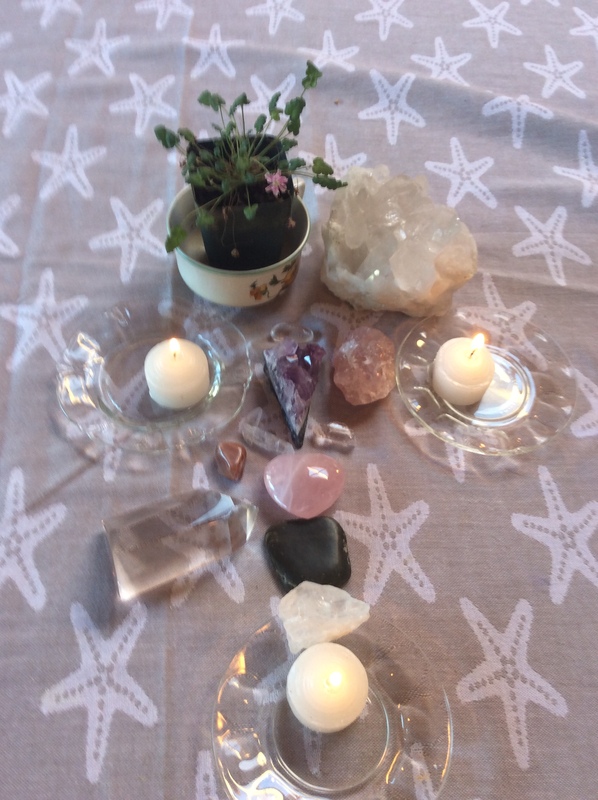 The photo above for You includes the light frequencies of Divine Love, rose Quartz, clear Quartz for increasing the Love and amethyst to affirm Your crown chakra. The green Big Sur Jade is for peace and prosperity and a moon stone to awaken Your right brain intuition.